Turning 16-years-old is a huge feat for a Labrador, or any large dog for that matter. Celebrating a milestone birthday this week with a visit to the doggy hair dresser, Sandy, a former resident at The Lost Dogs’ Home North Melbourne, is as happy and healthy as can be. 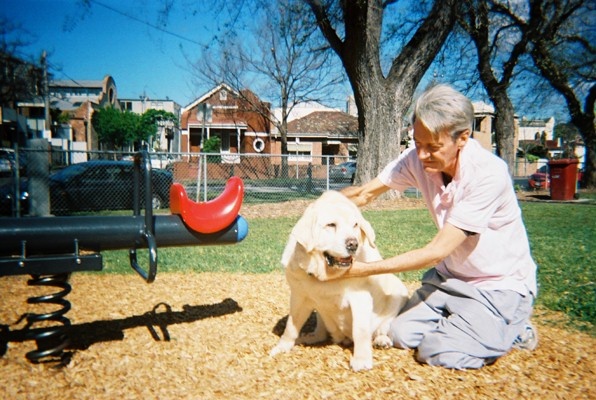 Proud owner, Francis Dwyer adopted Sandy from The Lost Dogs’ Home in North Melbourne back in 2001 when he came in to look for a new “four-legged family member”. On arriving at the Home, Francis remembers feeling that “…dogs of all shapes and sizes were saying, ‘choose me, take me’”. “For all the time Sandy has been with our family he has given us tremendous joy and great affection. We in turn are grateful to The Lost Dogs’ Home for giving us the opportunity to adopt Sandy into our family – we consider him one of us,” he added. From all of us at the Home, we wish Sandy a healthy and happy 16th birthday! !